This small town was founded during the Gallo-Roman period of the 1st century BC under the name of Augustodurum. It developed thanks to its location on an important crossroads between Lisieux and Valognes, and was surrounded in the 3rd century by a protecting city wall. This did not help much though as the town suffered heavily from Viking raids in the 9th century. But under William the Conqueror, the second golden age of Bayeux began : Odo, the half brother of William had become bishop of Bayeux. He spent the money he had gained from the Norman conquest of England to build the biggest cathedral in Normandy in 1077. The now famous Bayeux Tapestry was also made around the same time to tell the pilgrims coming to the cathedral, the majority of whom at the time were illiterate, the story of King William’s defeat of the English army of King Harold at Hastings in 1066. 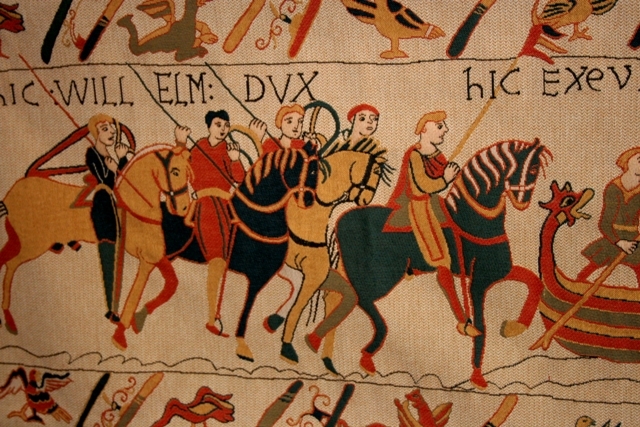 The Tapestry was originally made to be hung in the Cathedral for two weeks every year, but having come close to destruction several times during the last 950 years, it is today on display in a specially constructed case in the Bayeux Tapestry museum 200 meters from the Cathedral it was once made to adorn. If you want more informations, you can contact Bayeux Tourist Office.